TOP SPOT: Noosa Waters canals with Main Beach as the back drop - hot property. NOOSA reigns supreme in southeast Queensland's with its world-class beaches and lifestyle helping drive median house price increases above all others. "Tourism is one of the largest contributors to Queensland's gross state product, with almost 8 per cent of GSP coming from tourism,” Ms Mercorella said. "This is roughly $25billion in the year to June 2016, which means when that sector grows it offers employment opportunities and this attracts workers who need somewhere to live,” she said. She said the strong performance of the southeast corner's coastal markets has helped drive Queensland's growth in the last 12 months, with more than 58,000 houses sold and an annual median price growth of 2.4 per cent. Ms Mercorella described Noosa price growth "a whopping” result taking it to $655,000 - $100,000 more than the Sunshine Coast. "These two markets have powered ahead through the past 12 months,” she said. 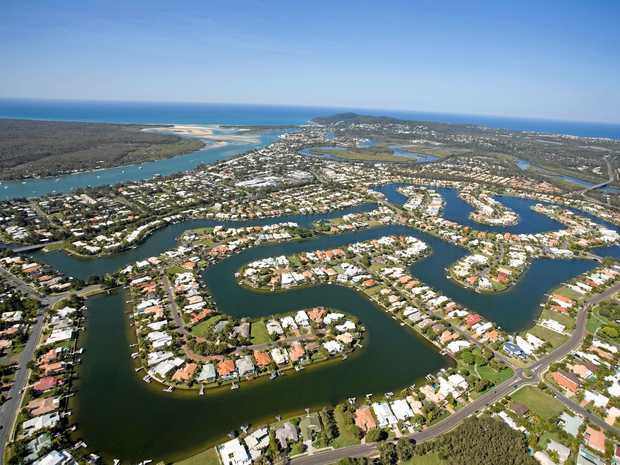 The REIQ said the unit market has been positive, growing 3.7 per cent on the Sunshine Coast and just 0.4 per cent over the past 12 months for Noosa's annual unit median price. "Looking ahead to 2020, house prices in the southeast corner are tipped to rise, with the QBE Australian Housing Outlook report projecting growth for Greater Brisbane of seven per cent, the Gold Coast six per cent and the Sunshine Coast four per cent,” she said. "This is consistent with the southeast corner's moderate growth in recent years.